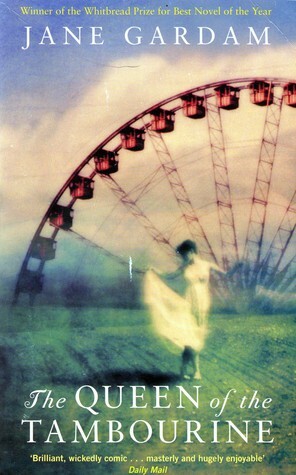 Winner of the 1991 Whitbread Award, The Queen of the Tambourine is Jane Gardam’s fourth novel, written well before Old Filth (2004) which is the novel which brought her to my notice. I was rather fond of that novel because Sir Edward Feathers (whose nickname Old Filth (FILTH = Failed In London Try Hong Kong) reminded me of an eccentric friend of the family from my childhood. I liked Jane Gardam’s style. Anyway, I’d had The Queen of the Tabourine on my TBR for ages, and I was in the mood for something interesting but not too demanding, but it turned out to be much more interesting than I’d expected. Once again, there is an eccentric character, and like Sir Edward, Eliza Peabody has travelled widely during the days of Empire, but there the resemblance ends. The genius of the novel is that the narration shifts and changes with Eliza’s state of mind and it is never quite clear how much of what she says and does is real. Middle-aged, and at a bit of a loose end now that her husband is back in England, she has busied herself with Good Works, but one suspects that most of her beneficiaries breathe a sigh of relief when she departs. Gardam’s droll vignettes confirm her as an exasperating woman, with only one real friend, one of The Dying, who recognises that there is more to Eliza than first meets the eye, and christens her ‘The Queen of the Tambourine.’ It is he who alerts the reader to the need to withhold judgement. As her personal life unravels and she tries desperately to create a new self, Eliza becomes a poignant character rather than a batty old bossyboots. There is much to like about this book, especially the sharp wit and dry British humour, but one of its gentler aspects is Gardam’s treatment of Eliza’s neighbours. At first she is an object of embarrassment and scorn, and they avoid her as best they politely can. But as it dawns on them that her valiant efforts are concealing a personal tragedy, they draw her into their lives and find themselves liking her. (Mind you, the scenes where the childless Eliza takes on baby-sitting are alarming, to say the least!) Middle-class communities are often mocked in British contemporary literature, but The Queen of the Tambourine shows that they are just like people anywhere, who mostly rise to the occasion when it’s necessary. Don’t forget that while I’m away from home, you can follow my travel blog at Travels with Tim and Lisa. Try the Op Shop or the library. Belgium — be sure to eat the waffles. Don’t avoid them because it is the usual thing to do. They are very good. If this the trip where you go do Aix? I have read other early Gardam, but not this one. I’ve read the Old Filth Trilogy and adored it, and I have The Queen of the Tambourine in my TBR pile, so I’m eager to dig it out now. It sounds like a rather intriguing structure and story. And I agree with Silver Season: you must have a Belgian waffle. I also highly recommend the chocolate and the fruit beer! I read Queen of the Tamborine a few years ago when I went on a little Jane Gardham jag. Finished the Old Filth Trilogy and several others including God on the Rocks which is very good. Priviledge Hill is also very interesting – related and inter-related stories about their time in the East. (Sorry, can’t remember details, but I did enjoy them all.